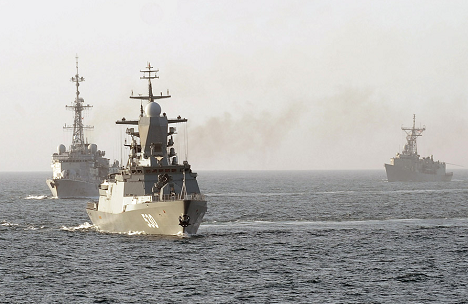 Four Indian warships take part in the Indra 2014 manoeuvres, which will be held in the Sea of Japan in mid-July. Officials from the Indian Navy are in the Russian Far Eastern city of Vladivostok for preparatory talks for the Indra-2014 joint naval exercises, Russian Pacific Fleet spokesman Captain First Rank Roman Martov told Interfax. “A delegation of the Indian Navy, led by the Indian Naval Staff's director for naval operations Alok Anand, has arrived at the Pacific Fleet's home base from Delhi. The second planning conference for the Indra 2014 international naval manoeuvres began at the Vladivostok officers' Club today,” Martov said. “The first meeting centered on the program for the Indian warships' stay in Vladivostok and their location at the Pacific Fleet's moorages, as well as nuances of the upcoming manoeuvres and the cultural program,” he added. Indra is a portmanteau of India and Russia. The biannual exercises commenced in 2003 when nine warships of the Russian Navy departed from Sevastopol and Vladivostok for the Indian Ocean and engaged in a number of exercises with the Indian Navy. In 2007, the drills were held in Sea of Japan. At that time five Indian warships arrived in Vladivostok under the command of the Indian Eastern Fleet's commander, Rear Admiral R.K. Dhowan. The Pacific Feet was represented by two large antisubmarine ships, a missile boat, a diesel submarine, base trawlers and auxiliary ships under Vice Admiral Sergei Avramenko's command. The last edition of the Indra Naval exercises was held off the coast of Mumbai in December 2012. The Udaloy class destroyer Marshal Shaposhnikov led the Russian squadron at the exercises. After Indra-2012, the ships proceeded onwards for anti-piracy duty by the Gulf of Aden. Based on an article published by the Voice of Russia.